Diabetes can raise the risk for cardiovascular disease and stroke. When your senior loved one develops diabetes, ensure the disease is well managed and monitored. Here are six things to do when your loved one develops diabetes. After developing diabetes, your loved one may be taking an oral antiglycemic agent or insulin injections. It’s important to make sure your parent takes the required diabetes medication in the correct dosage. Also, make sure the medications appropriately correlate to mealtimes so your loved one is less likely to experience dangerous spikes in blood glucose levels. Caring for older adults with serious health issues can be a challenging task. Families who find it difficult to care for their aging loved ones without assistance can benefit greatly from professional respite care. Green Valley, Arizona, family caregivers who need a break from their caregiving duties can turn to Home Care Assistance. Using our proprietary Balanced Care Method, our respite caregivers can encourage your loved one to eat well, exercise regularly, get plenty of mental and social stimulation, and focus on other lifestyle factors that promote longevity. If you’re caring for an elderly loved one who has diabetes, prepare and serve therapeutic foods tailored to diabetics. Complying with a diabetic diet may reduce the risk for diabetes-related health complications and the need for diabetes medication. Exercise is an important intervention in the management of diabetes, and it can alleviate stress and lower blood sugar levels. While maintaining a consistent exercise routine is important, you should consult with your loved one’s physician prior to starting a new exercise regimen. Unless your loved one’s diabetes is managed by his or her doctor, the disease may progress. The doctor can order routine lab tests to determine if your parent’s blood glucose levels are too high or too low and suggest a treatment plan that could prevent complications. Excess weight can raise blood sugar levels and make it difficult for seniors to exercise. To help your loved one maintain a healthy weight, ensure his or her meals are nutrient-dense and low in sugar. Losing only a few pounds may make a positive impact on glucose levels. Sometimes, diet and exercise are the only interventions necessary to manage diabetes. If your parent maintains a healthy weight and eats right, he or she may not need to take antiglycemic medications. If your loved one is unable to do so independently, you’ll need to monitor his or her blood glucose levels before and after meals. 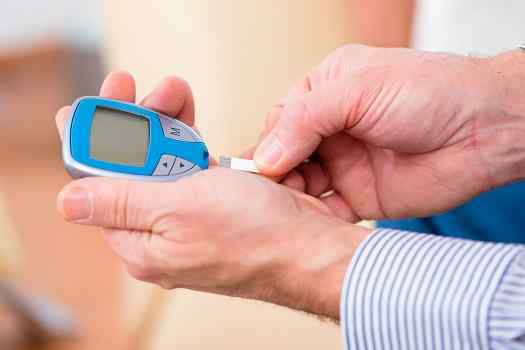 To achieve accurate glucose readings, you’ll also need to make sure the glucose meter is properly calibrated. If the readings aren’t accurate and your parent takes antiglycemic medications based upon the erroneous readings, he or she may develop hypoglycemia or hyperglycemia. Older adults living with serious health issues can benefit from professional in-home care. If your senior loved one needs hourly or live-in care, Green Valley Home Care Assistance can help. Our caregivers can assist with exercise and mobility, prepare nutritious meals, provide timely medication reminders, and help with a wide array of other important daily tasks. To learn about our high-quality in-home care options, give us a call at 520-625-2050 today.